I don’t know quite what I was going for here, so I can’t say if it worked or not, but I do kind of like the image I was able to capture. I shot this right before the autumnal equinox (almost exactly one year after I captured this similar photo) and didn’t plan on taking any pictures at all until I was out the door on my bike and heading to work. As soon as I got to the end of my driveway I looked to the east and saw a fantastic sunrise just beginning, with nary a camera on me. I quickly turned around, ran back inside, and grabbed my D750 + 70-200mm lens to see if I could capture even the faintest hint of what this scene looked like in real life. In the one minute it took me to get my camera and return to my bike the sun was already well over the horizon, and the view I saw from my driveway was already subsiding so I frantically rode my bike south a few blocks and was able to take some pictures looking down the east/west road that I take to campus. I don’t like that there’s so many power lines crisscrossing the entire image but after a few shots I tried to embrace the urban elements a little bit since there was no way to actually get rid of them. To that end I specifically tried to take some pictures with cars in them, as a way of adding a bit of life and activity to the sunrise. I mean, if it’s clearly an urban scene anyway (power lines, street signs, etc.) then why not embrace it all the way? I underexposed the image while shooting at f/2.8 and ISO 100 in order to get a clean picture, not overexpose the sun, and add a bit of foreground blur just for fun. Shooting at a smaller aperture might have resulted in a bit sharper image overall but it would have made the Jeep more in-focus, and I like that it ended up being just a bit blurry in the final image. If you click on the picture and view the full-size original you might notice a glow on the undulating power lines extending to the horizon which was certainly not intended on my part but ended up being kind of interesting as well. It’s always fascinating to me how quickly scenes like this disappear. Five minutes later this was entirely gone and it was just another sunny morning like any other, but for a brief window it was downright inspirational and a great way to start the day. It’s a good reminder that from the rising of the sun to its setting, the name of the Lord God is to be praised. Another inspirational but simple composition. I admire that you carry a camera all the time in your bike, ready to snap these wonderful images. Fully agree to under expose slightly images like this. Grad ND filter will be impractical in situations like this. One question I have is: where do you focus to get correct exposure metering? Thank you. I think having the street lamp in the sun would have also made for an interesting image. More of man made and nature interacting. That’s a good point, Al. Hmm. I’ll consider your idea the next time I’m taking a photo like this. Thank you! I really like your choice for exposure. I appreciate the story as well. I really like this image for the mood that it portrays. Since scenes like this are so fleeting, it emphasizes the point that we need to be present to experience them. So much of photography seems to depend on being in the right place at the right time. I have thought of it this way: God paints the picture and we have the privilege if we have the skill to capture it and we have the photograph as a memory. A very nice shot, Simon! Stunning! Fantastic! Love the shot. I’d have missed it by not thinking quickly enough about the proper settings. Another technically perfect image conveying the beauty around us! I enjoyed your narrative and how you accomplished this scene. What I’ll remember most is that you did not have your camera with you and had to run back to the house to get it! I can’t count the many times this has happened to me. I now have a small point and shoot in my purse at all times, as well as my phone. I am getting better at taking my big girl camera with me everywhere I go. One of our well-known local photographers told me to never go anywhere without my camera. Good advice. 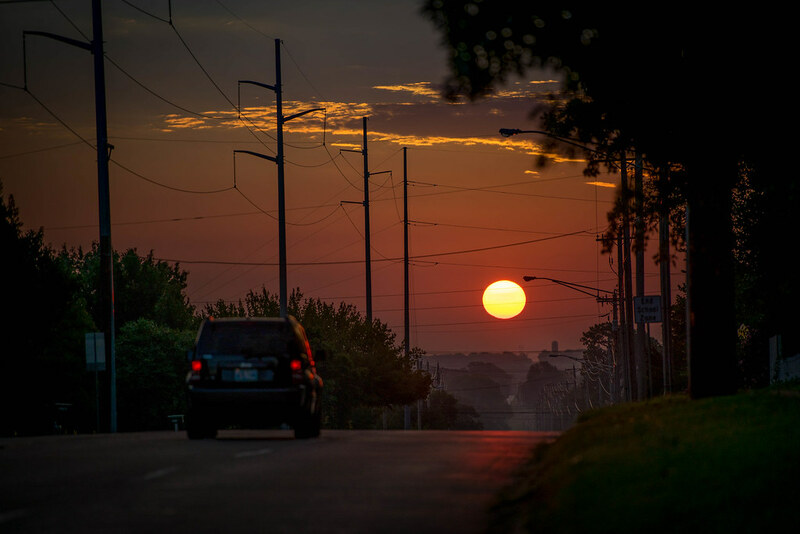 Did you frantically ride further down the road to catch the glow on the power lines? There is a shortcut I take to get home in the evening. It must be due west because the sun is straight ahead. The glow on the power lines is gorgeous. I commend you for having your camera with you at all times. No, I wish I would have! I didn’t have much time since I did not want to be late to work, but hopefully next time I will be able to plan things out a bit more. I have been late to work for just that reason. I love the red glow on the pavement. I also appreciate you conveying your thought process. That actually helps me learn a lot since I am a novice.